Not quite curb finds, but close. Shed finds. 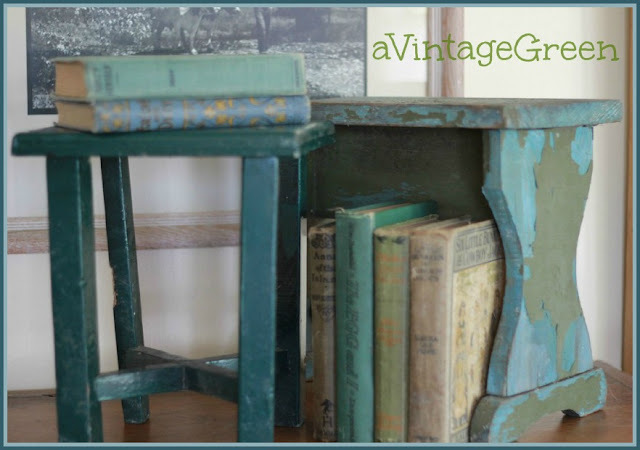 The two small stool/benches go so well with the shabby books I found at a genuine 'we want them gone' garage sale last weekend. Maybe just a bit of 'touch up' on the bare chipped paint/wood on one leg of this little stool/bench and a good clean, that should be it for this little somewhat slanted stool/bench. Handy, great size for small vignettes too. I will carefully brush the loose paint edges and wax this little bench (very carefully so I can keep the very shabby look and as much paint as possible intact). Love finding authentic shabby benches. Definitely two old favorite things (plus those lovely books too). Love that color and that chippy look. I don't think you can ever really copy that real look of age. I love finding something old like that and love it with the books. 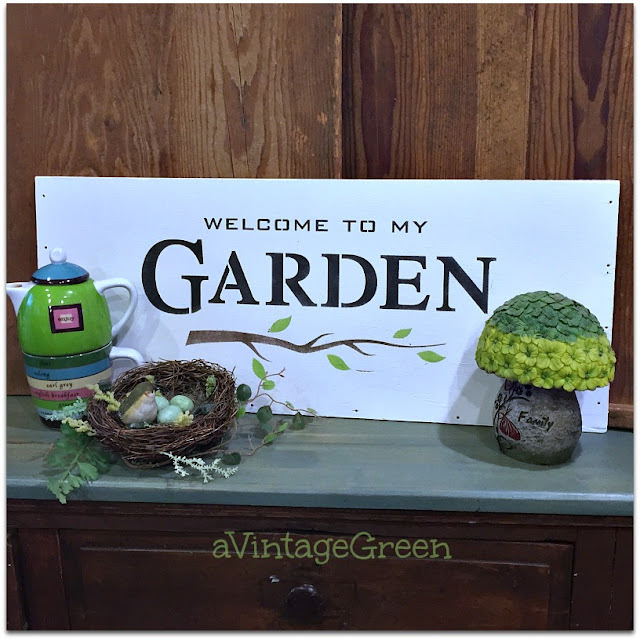 I love "we want em gone" garage sales - great finds! I love the colour and the old feel here. Very cool little benches! They look great with the vintage books! 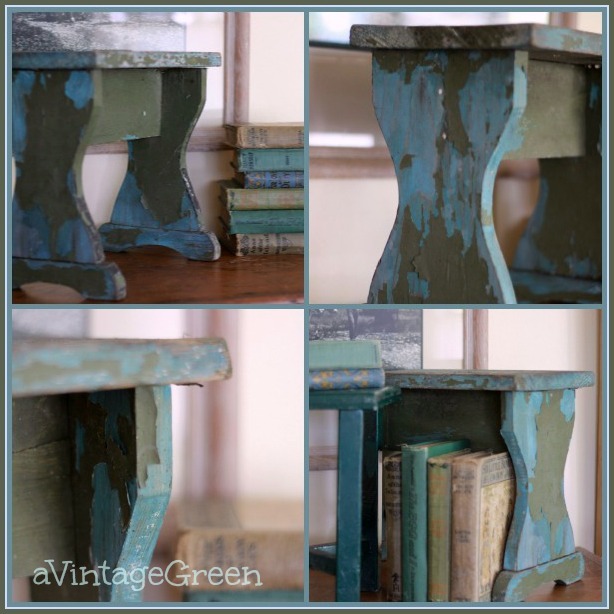 These little benches are great and just a perfect example of thrifty things. Thanks for joining Diann and I for TTF! ...if those go to your booth...I am peeling over there! they are adorable! Just beautiful! My favorite color combos. 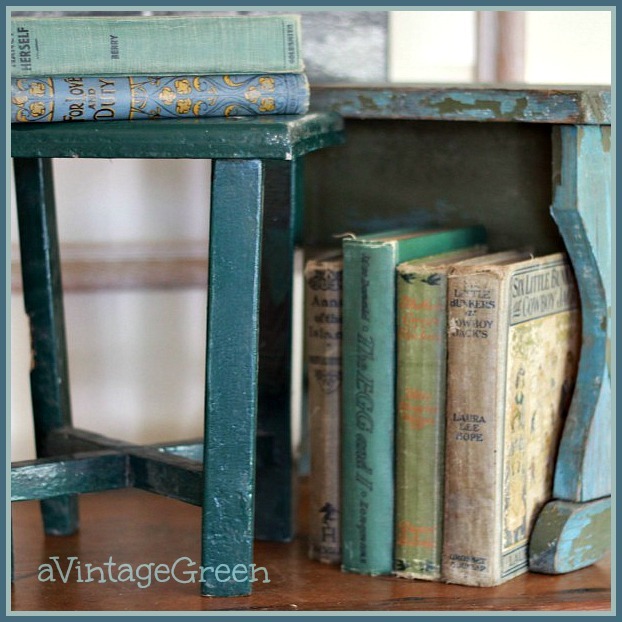 I have a set of vintage Landmark books that I removed the paper covers to reveal lots of those greens and blues. They'd look lovely with some wee chippy benches like yours :) Popped over form Mockingbird Hill's linky. I love these! Great finds both! The color on that first one had me at first glance. Thanks so much for sharing them with us. Very, very cute. I'm dropping in from Claudia's party. Enjoyed my visit! I love these benches and the books................and most of all love them together, just perfect! The titles sound interesting - do you ever read old book finds? They make me realize how different the old stories were compared to some of the junk printed today............and of course the bindings are gorgeous. Stopping by from Rooted in Time. Great finds. I love the chippy turquoise color. It seems like a bench is the perfect sized project, not too big but still furniture and a great way to display things!. Oh! Those are so charming Joy! Just my colors, love blue greens. Benches and Books ... looks great together. Thanks for sharing your treasures. Love the blue one, with its curves and chippy paint, especially. Old books are so beautiful - I love the graphics and the feel of them. 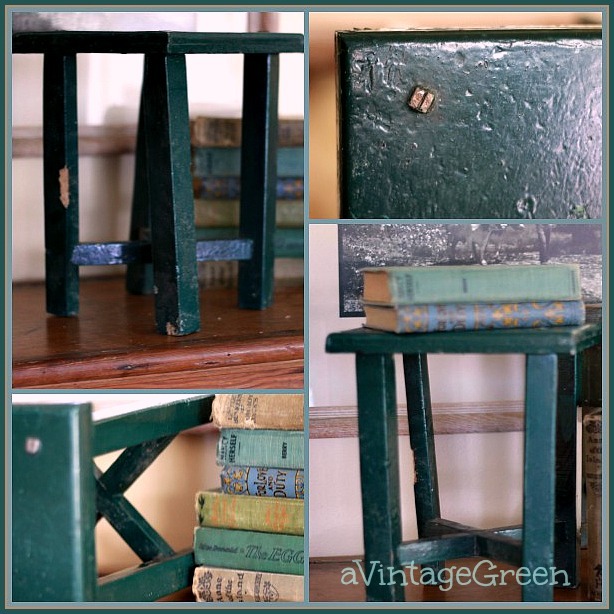 Love those chippy benches and the vintage books! Oh my Joy, love them! The benches and the books are all marvelous! Thanks for sharing with SYC. Hi Joy, just wanted to let you know that I will be featuring you at SYC today.